Zinoviev Club member Dmitry Kulikov reviews the outgoing year and its key events. The last week of the year is a time for taking stock. Such is our tradition. It's almost like watching The Irony of Fate. So we will follow this tradition and not only try to recall the key events but most importantly, ascertain their meaning and significance. Of course, the Minsk Agreements that were signed at the beginning of the year were Russia's major political success. We brought to an end the massive, indiscriminate and absolutely inhuman shelling of residential areas in the unrecognized republics by Ukrainian government forces. We took the main and only tool of pressure on the people and therefore the republics' authorities from the Ukrainian government's hands. A real shooting war was transformed into an armistice, albeit not complete — to be more precise, into a state of "cold," or at times, "lukewarm" war. Understandably, Kiev is not in a position to implement the Minsk 2 agreements. It neither wants nor is able to. We have often discussed why this is so. Therefore, I believe every available method should be used to force it to comply. This is by far the most important process. In addition, Minsk 2 has helped shift the situation into a mode of "peaceful competition" between the republics and Kiev. What are we looking at? The republics have a lot of problems and difficulties, especially those created by Kiev, but we see a rather positive trend in the development and consolidation of the republics' proto-statehood and in the social and economic spheres. In Ukraine, we see a purely negative trend. Both the state and the social and economic conditions are continuing to degrade. 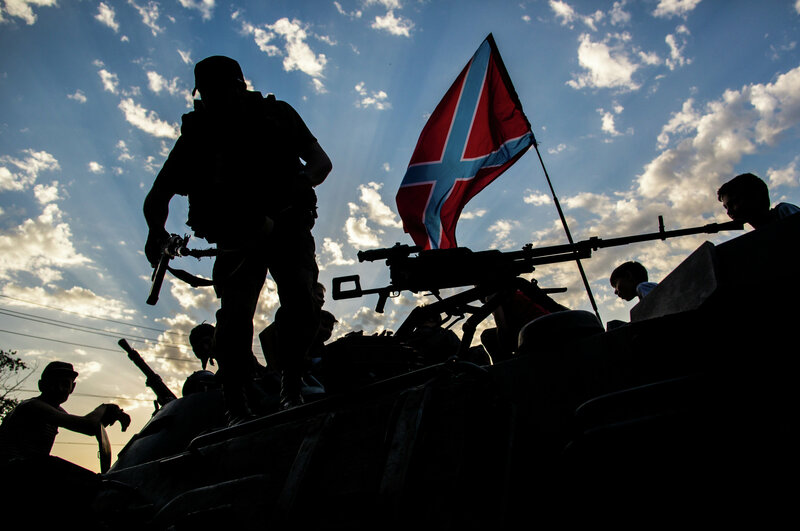 Donbass and Russia definitely benefit from the state of peace or at least "quasi-peace." I believe that we should strengthen and support the republics and prevent Ukraine from resuming the shooting war. Everything else will be done for us by the Ukrainian authorities. In this context, I would like to take issue with our hysterically patriotic public over the much-touted idea that what should have been done in February was not signing a peace deal but storming Mariupol and other Kiev-controlled cities in the Donetsk Region and advancing to Kiev and Lvov. I am not in a position to assess the military capabilities of the republics' armies, as I am not an expert and have no information on this, so I will not play the role of armchair general. However, supposing this was possible even militarily. Then the question arises: What kind of operations would the republics need to carry out to free these cities? Say, the republican armies pound Mariupol or Krasnoarmeisk by artillery, resulting in a high civilian death toll? Assume responsibility for the deaths of thousands of innocent victims? In this scenario how are we any different from the Nazis in Kiev? There are many similar questions regarding "a plan for the republics' decisive offensive operation." Almost a year has passed since the Minsk 2 agreements were signed, and I am still confident that this political victory is a key to the final victory. Meanwhile, Kiev will do all it can to thwart the implementation of these agreements, including by military means, as it understands their real meaning and significance. The Russian operation in Syria is a multidimensional and multifaceted effort. First, it is a real fight (not the pretend, for-show fight put on by the United States) against terrorism far beyond our borders. By eliminating the terrorist organization, destroying the terrorists' main forces and depriving them of funding, Russia greatly reduces the likelihood of organized terrorist attacks against our state. Second, we have shown that it is impossible to remove Syria's legitimate government by force and therefore have prevented the country from being transformed into another zone of chaos with no statehood of its own where interested states can acquire territories, oil resources and so on. Third, Syria and the Middle East are elements, as well as a playing field, in a big geopolitical game. Russia has stated that it does not recognize a world order with American hegemony. We have a strategic alternative. A multipolar world is not an illusion. We are ready to fight for it and most importantly, fight for a respectable and well-deserved place in this multipolar world. It seems that we have finally realized that in the so-called world division of labor and world order, there are only two categories of places — a place that will be shown to you and a place that you can win and retain, and that there is a fundamental difference between the two. This realization is what makes today's foreign policy radically different from the foreign policy of the 1990s. In the 1980s, we hoped for an end to the Cold War and peace with "universal human values." This was the ideological basis of what was known as perestroika and new thinking. In the early 1990s, we believed that the Cold War was over and that it had ended in peace, as it was impossible for one side to win. Peace without annexations and indemnities. However, before long, we were told that Russia was the loser and that the "winner" could do to us whatever it liked. We were slapped with annexations and indemnities. As we did not surrender, did not cave in and did not admit defeat, the war against us continues. It is an undeclared war that came to replace the Cold War. It is more complex and tougher than its predecessor. It has been a difficult year, a year of many tragedies. All those who were killed on the fronts of this undeclared war are our heroes — Donbass militia members and civilians, the passengers on our plane that was blown up by terrorists in the Egyptian airspace and our pilot and marine in Syria. All of them are our heroes and victims of the undeclared war against our Motherland. We will always remember them and will be worthy of their memory. We will be worthy of their memory as we were of the memory of the Immortal Regiment soldiers in the year of the 70th anniversary of our Great Victory in the Great Patriotic War. As Vladimir Vysotsky sang, "Our dead will not leave us in the lurch. The fallen still guard us forever." I believe that we fully sensed this as a people, as a new political nation on May 9, 2015 during the Immortal Regiment march. It seems to me that this year we have shed many illusions and false goals. We have formulated and upheld our political sovereignty. We have prevented the Russian economy from being "torn to shreds," and we have prevented the destabilization of the country, contrary to our opponents' expectations this year. However, we desperately need to secure our economic sovereignty and implement economic growth and social development programs. We realize that domestic policy and the national economy are our main fronts. We have every chance of winning this undeclared war. It is crucial not to make mistakes. So far we have been on the right track and this is almost half the battle.